Homegames workshopTyphus – Herald of Fabulous?! So, anyone who has been following the Death Guard releases over the last few weeks is likely aware of the criticisms flying around. 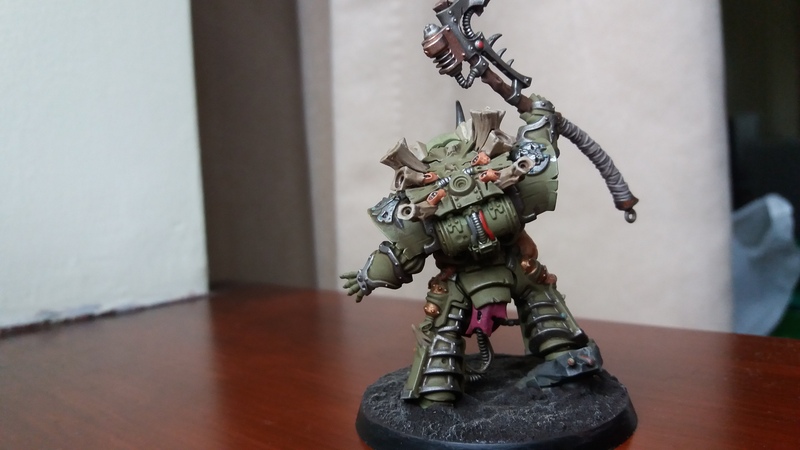 The new Typhus model landed on Saturday and many have been doing conversions to “improve” his stance. Many people feel he’s a little too…excited? Show-offy? 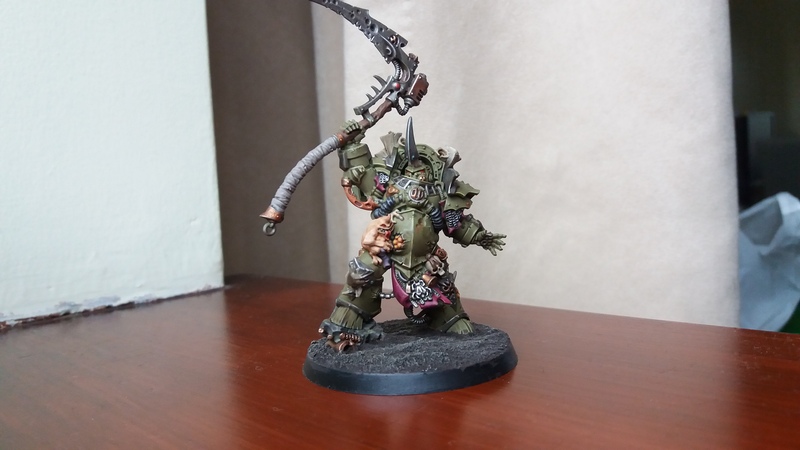 Have a gander below for yourselves as my near-finished Typhus. I can completely understand that this new pose is a touch odd for a hulking Terminator of Nurgle. It’s very much “You guys, I finally found my scythe!”. It’s not quite as menacing as I would have personally preferred. However, when you stand him in front of some other Death Guard Terminators it’ll certainly help to make him distinguishable. Which may or may not be a good thing as your opponent will clearly know which one to plow all his shots into if possible. For me, though, I think he’ll look very imposing surrounded by the Deathshroud. At this point let’s take a look at the older Typhus model. The shots below were painted by myself many years ago as it was my first Chaos model. Be gentle! Yikes. I mean, the paint job does it no favours, of course. It’s metal and chipped to high heaven which also isn’t helping. But it’s not exactly an exciting sculpt, is it? it’s quite bland in my eyes. I do love that many things have carried across such as the Nurgling and some of the heavy piping. However, I’d much rather Typhus be a focal point of my Death Guard, maybe not to the level of Mortarion, but still distinguishable. If you glue the flies onto his back then the new pose also makes a bit more sense. He’s the Herald of Nurgle, right? Likely this stance depicts his summoning of the Destroyer Hive. However, I was recently told the painted flies with red eyes make him look like a Christmas tree from behind…I couldn’t bring myself to do it. I cannot unsee the festive spirit! How do you feel about some of the new sculpts from Games Workshop? Are there any other eyebrow-raising examples that stand out to you? Mortarion received some flack, but what about non-Death Guard units? We’d love to hear your thoughts! Honestly, I love the new typhus model with the hive behind him, also his pose is really great but I’ve seen some people who don’t like it … every peoples have different taste so, I can understand. Absolutely, it takes all sorts to make a world. I’m much less irked by the new pose compared to a lot of people, it may seem. Being honest, I’m still elated at the entire new Death Guard range that I’m not going to moan too much at all!